My mom would have been 70 this month she died this year at the start of January, so it is an upsetting month for us. This weeks competition from Spoonflower is "Moms recipe tea towels" the brief was "No matter where you live in the world, nothing spells comfort like a home cooked meal from your mom or grandmother. Celebrate the important culinary women in your life this Mother's Day by designing a lovely recipe just like mom used to make. Recipes should fit a fat quarter-yard of our Linen-Cotton Canvas fabric. 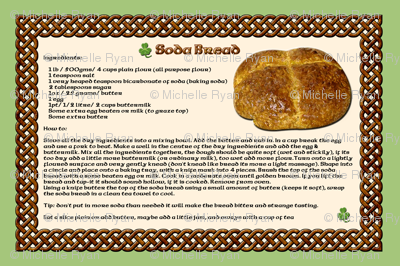 Entries will be previewed at the scale of a fat quarter (27" x 18")"
So the image up top is my entry "Mom's recipes - soda bread tea towel" with yes my moms soda bread recipe is on it. She made this all the time often making extra to give to friends. I have this recipe here on this blog on a previous post from a few years ago, if you fancy making it :) My mom liked her fancy tea towels I am sure she would have been so happy to see the recipe on one.